First of all I hope that you guys will greet the following with open arms as there is something exciting coming up for the BMW tuning market which stems from a tuning company that you have all no doubt heard of in one way or another, they’re not only one of the largest tuning companies currently within the Ford tuning sector but they are also one of the most exciting and up & coming tuning companies… AND now they have developed a tuning box for the (M)x35i – both PWG and EWG and the newer (M)x40i, as well as some of these tuning boxes for some of the faster diesel BMW’s. It is DreamScience Motorsport. We have been working tirelessly over the last few weeks developing and testing these systems and it is now time for the boxes to go onto the market for the end users… you guys. Initial results of the box are very promising, seeing as much as a 10-15% increase in power [on the first dyno run!!!] and as much as a 20% power increase once the box has effectively learnt the car and manipulated the cars ECU to run the way that it wants the car to run. It works in a similar way to other products on the market, different maps all contained within the box, however unlike other models of tuning box’s, the pre-set map settings are contained within the box and the settings are controlled via a separate remote. We are working on this to provide the most ease of use system we can. The maps can be altered via settings within the box itself to find the map that suits you the best, starting at map 1 all the way through to map 16. Each box has it’s own % gain, these gains are to be advised on a car by car basis by DreamScience. The later the box, naturally, the more increase you see. 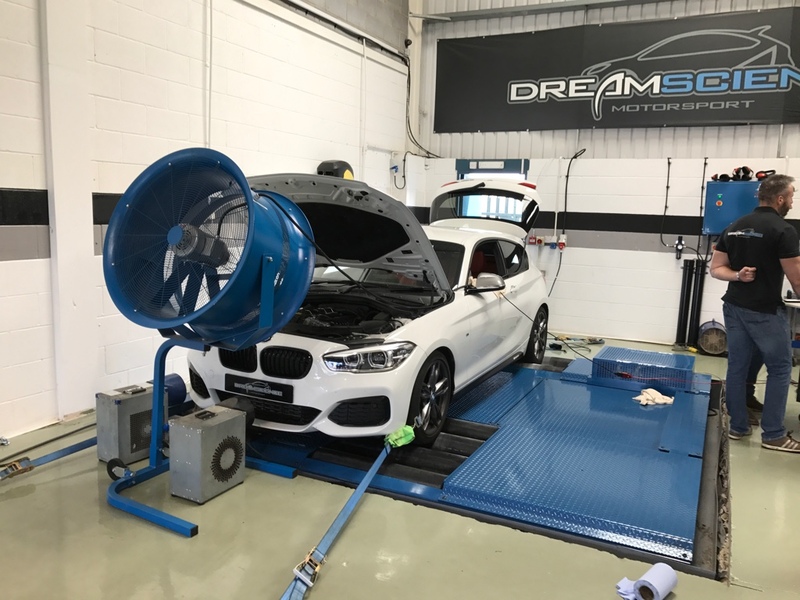 I, personally, have been driving around with the Powerbox Nitro on my car and it also must be said that I have no connection to DreamScience, I do not work for them, I am simply helping a mate get into the BMW scene and I hope you will all will have a read and pass some comments. With the box on the car, the car is transformed. For instance, a family member has an M4 and my M135i LCI is noticeably (and surprisingly) quicker than the M4… having experienced another tuning box from another BMW tuning company, I personally would say that it is on par, and considering this is the first I can’t wait for the next. There will also be a range of suspension components, spacers, exhausts, cosmetic pieces and many other things being developed for these cars, which will hopefully find it’s way onto my car. I hope that if anybody does have any out of turn opinions then this will be kept to theirselves. Get in contact with me, I have to say this is not a sales pitch, simply advising – THEY ARE CHEAP AS WELL! Last edited by harryj41 on Tue Nov 15, 2016 2:41 pm, edited 2 times in total. AW 5dr M135i Auto with TMC and MPE, Fiesta ST150, Mini Cooper s, Mk6 golf GTi, Lotus Elise 111R, plus a couple of boring cars. I had a DreamScience box on my old Focus ST, it was an excellent piece of kit and made for some serious power gains. It was a plugin ECU device rather than a built in box but it was awesome. Last edited by OneTwenty on Tue Nov 15, 2016 2:18 pm, edited 1 time in total. Hi Harry, it's a bit difficult on here to tout a friends business without it 'feeling' like an advert. "We have been working tirelessly over the last few weeks developing and testing these systems" - suggests you have been working with them to develop this box and you're asking us to contact you.. not the company? 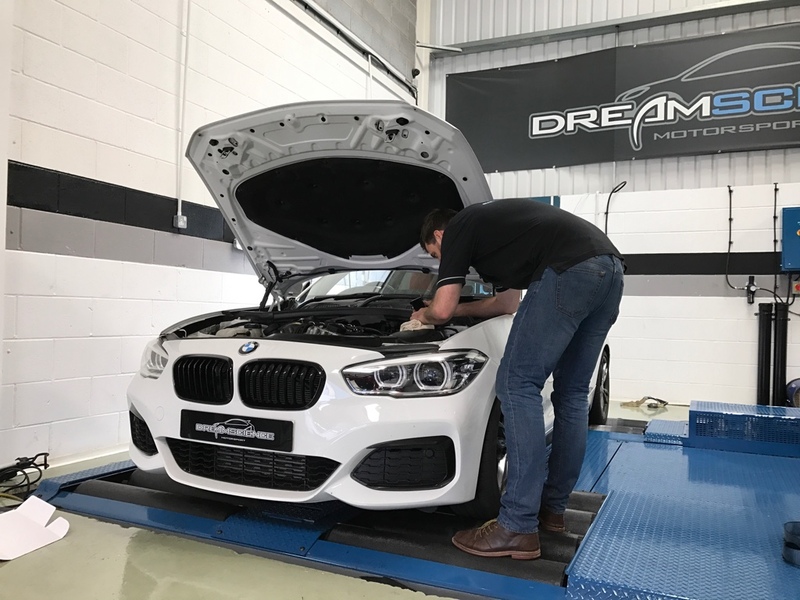 Dyno results on std, sports CAT and upgraded IC cars, EGT result from each level tune etc - assuming these levels of tune have been tested, as I assume they corrispond to the 'Stage' levels in your post? I see pictures of a car on a dyno, so there should be some results to scan? .. and prices.. and something on their website..
Last edited by Richy_Boy on Tue Nov 15, 2016 2:27 pm, edited 1 time in total. M235i - KONI Yellow Shocks, H&R Springs, BMS Intake, M Performance Exhaust & Aero, 403m wheels..
Great bunch of lads at DS.. Took my Focus ST to them for its Block Mod..
i had a whole load of stuff from these guys over the years 2 focus st's and a mk2 focus rs , i even got a free t shirt when visiting for a quick remap. If you've bought one of these for yourself and have the dyno chart to show the improvement, then please post some actual results. I've never heard of them.. but then, I haven't owned a Ford since the 90's! 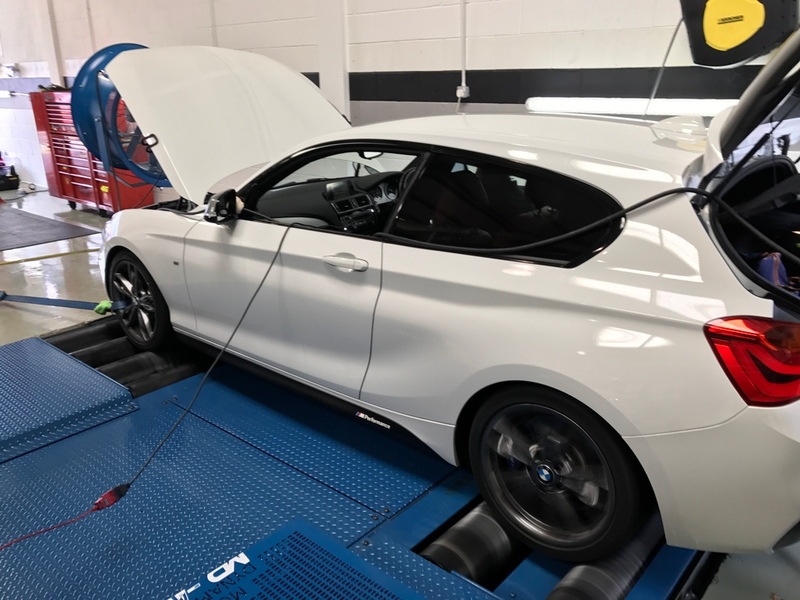 At the minute your post is saying "wow, really great.. super powerful.. you can have over 400bhp.. they choose which box you need.. trust me.. it's cheap.. here's some pictures of a car on a dyno". So, to clarify one foggy point.. if you buy a 'stage 1' box.. then you upgrade your car.. do you have to buy a 'Stage 2' box and sell/throw away the old one? Or can you p/x the old for the upgraded one? If anyone can be bothered to call up.. please post some info on price. First post on here!! Makes a change from the RS owners Club! Anyway, just to Clarify. Harry wasn't affiliated with DS in the beginning or in anyway connected to my Business. We purely used his car as an R&D test bed. So in a Nutshell we have been working like madmen to bring you a new Tuning Box. But we have been waylaid by a large Ford-based deal that is about to go live. We have a product range being placed into 108 Ford dealerships, so as you can imagine we have been busy boys. I have re-developed a system for the new F2* M135 pwg/ewg and the M140. (more models to be added imminently) We offer three levels of box but personally the most useable and popular is the Stage 3 box as the power can be reduced or increased by the user. Each box come with one adjustable map, not a plethora of unusable maps. Our box adjusts the boost level on one map, this map has been extensively developed, tested, driven on the road and track. we now feel that this map is ready for release. I am also working on a pedal box to work in conjunction with the power box. The pedal module helps override and improve the standard throttle response. So when driving with DSC off, the throttle response can be sped up. I love it in my 140, works really well. The pedal box comes with a in-cab switch to turn the speed up and down. In addition to Power upgrades we have finished our own range of Lowering Springs 20mm all round and Wheel Spacers 25mm all round. (pics to be added to the Website) We developed the Lowering kits with KW. We will be also adding the Adaptive/non-adaptive Coil over kits soon. We will have all power upgrades and suspension entries on the website by the end of play tomorrow complete with Prices, images, graphs and Write. ups. . 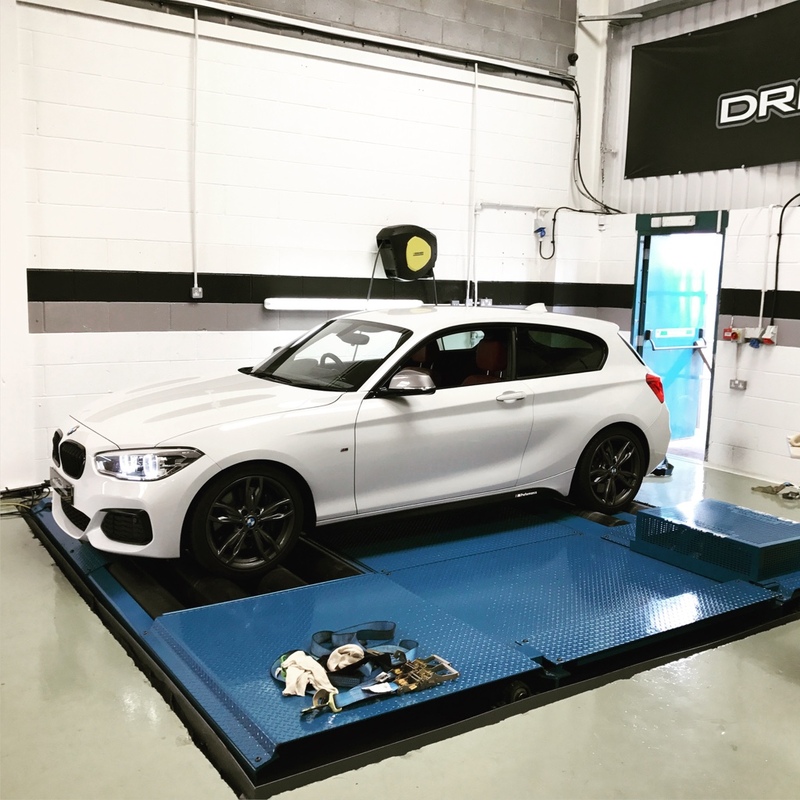 I am about to do the final dyno hit on my M140i now! Sounds great, can't wait to see the results! I am interested how the b58 system manages increased power/boost etc in regard to intake temps. Coming from a Subaru (and a megane rs stint in between) background it was all about intercooler management to cope with bigger boost etc (after decat/exhaust mod). Of course the b58 runs a totally different setup!!! I still find it strange when I look at the front of my car and cant see an inter boiler!!!! We will update Dyno results tomorrow. I would like to point out, our dyno reads true and we aren't in the game of Fluffing up Dyno figures. It only causes trouble further down the line when one of our customers goes to another dyno later down the line!